I started my grad school career in Public Health in the summer semester of 2014 as a part-time masters student, also working full time in public health research for the same university. Not only were most of the other students in my program full-time students, but they also mainly came straight to graduate school directly from their undergraduate degree. 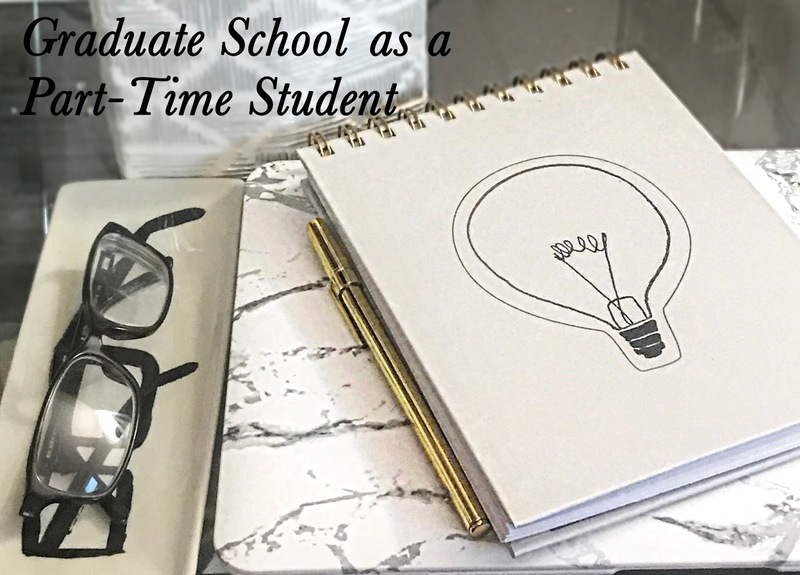 These differences have made me approach school a bit differently than some of my classmates, so I wanted to share some of the things I've learned during my time as a part-time student. Being a part-time student is a long process - while full-time students are graduating in two years and moving on, you can start to feel like you're barely trudging along. But it's better to take an extra year and only take a class or two each semester rather than trying to squeeze in as many classes as you can. You'll end up really wearing yourself thin, and not leaving yourself with any free time. Sometimes, the curriculum and requirements of a program can change one year to the next, and it's really important to know which version applies to you. Otherwise, you may end up (like I did) taking extra classes that aren't required for you because you didn't know that you were grandfathered in to an older set! With work deadlines, school deadlines, any other professional obligations, and your social deadlines, it can be hard to keep everything straight. I highly recommend some sort of agenda, whether on paper or online, to keep track of due dates, class times, meetings, and personal obligations. It will make you feel less stressed and overwhelmed to know that you're not forgetting about anything. I feel like this one should be obvious. I'm not going to pretend like I went to every single class while I was an undergrad. But by the time you're in graduate school, you're choosing to pursue more school because you think it will help you in your future, and you're genuinely interested in the program. So even if you're tired, and lecture is boring, you should go. Even if you think your professors don't notice, they do. There is absolutely nothing worse than seeing every student look down and pretend to be thinking really hard after the professor asks a question. If you've done the reading and are paying attention, try to participate if there's an opportunity. It will help class go faster, and I always find it helps me learn and remember things more easily. I have had some graduate school professors who definitely expect you to dress up a bit for class - pajamas and sweats would definitely not have been acceptable. And it's more than just clothes - don't use abbreviations in your e-mails, and don't ask for an extension the day an assignment is due. Are any of you in graduate school? I'd love to hear from you - share your own tips in the comments!